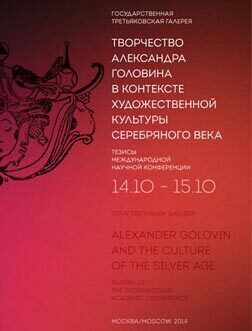 THE TRETYAKOV GALLERY HAS OPENED THE EXHIBITION 'ALEXANDER GOLOVIN. FANTASIES OF THE SILVER AGE", DEVOTED TO THE 150TH ANNIVERSARY OF THE ARTIST'S BIRTH. GOLOVIN'S OEUVRE, WHICH IS DISTINGUISHED BY THE INIMITABLE "GOLOVIN STYLE", ELEGANT DECORATIVENESS, INEXHAUSTIBLE IMAGINATION AND GREAT ARTISTIC TEMPERAMENT, REFLECTS THE ESSENTIAL ICONOGRAPHIC AND STYLISTIC FEATURES OF THE ERA OF SYMBOLISM AND ART NOUVEAU IN RUSSIA, AND BECAME ONE OF THE LANDMARKS OF ITS PERIOD. In June 1877, Vasily Polenov came to Moscow, intending to work on a subject from Russian history – "The Tsar's Unworthy Daughter Takes the Veil" – and to settle in the capital for some time. You have in your hands a special issue of the “Tretyakov Gallery” magazine that is dedicated to the life and work of the distinguished Russian artist Ivan Pavlovich Pokhitonov (Pokitonow) (1850-1923). For most of his life he lived in France and Belgium, but he never lost touch with Russia or Russian art as he considered himself a “Russian artist”. The poetic expressiveness of his work, so inherent in Russian “mood landscapes”, seamlessly came together with the refined French painting style, combined with the artist’s highest standard of excellence that he applied to his paintings. IN 1875, TWO YEARS BEFORE IVAN POKHITONOV'S ARRIVAL IN PARIS, A VENTURE CALLED THE “PARIS CERAMICS WORKSHOP OF RUSSIAN ARTISTS" WAS SET UP; IT WAS ESTABLISHED ON THE INITIATIVE OF ALEXEI BOGOLYUBOV IN A SPACE RENTED FROM AN INDUSTRIALIST CALLED GILLOT, AND IT WOULD CONTINUE TO OPERATE UNTIL THE EARLY 1880s. PARTICIPANTS INCLUDED MANY RUSSIAN ARTISTS LIVING IN PARIS, FOR WHOM THE WORKSHOP WAS ONE OF THEIR SOURCES OF INCOME OUTSIDE RUSSIA (THEIR STIPENDS FROM THE ACADEMY OF FINE ARTS WERE INSUFFICIENT TO COVER ALL NECESSARY LIVING EXPENSES). THE ARTISTS IN ONE SITTING APPLIED IMAGES TO FINISHED PLATES AND DISHES WHICH WERE THEN HEATED IN A KILN AND SOLD. THE VENTURE ATTRACTED THE ARTISTS FOR ITS NEW CREATIVE OPPORTUNITIES. THE COLLECTION OF IVAN POKHITONOV'S LETTERS TO PAVEL TRETYAKOV AND ILYA OSTROUKHOV AT THE TRETYAKOV GALLERY'S DEPARTMENT OF MANUSCRIPTS IS THE MOST COHERENT SET OF DOCUMENTS TO BE FOUND IN THE BODY OF ARCHIVAL MATERIALS, INCLUDING LETTERS, BIOGRAPHICAL INFORMATION, COMMENTS AND REVIEWS, RELATING TO POKHITONOV'S LIFE AND ART. 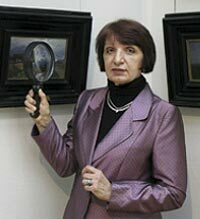 OTHER COLLECTIONS INCLUDE THOSE AT THE CENTRAL ARCHIVE OF LITERATURE AND ART (MOSCOW), THE RUSSIAN MUSEUM'S DEPARTMENT OF MANUSCRIPTS (ST. PETERSBURG), THE ARCHIVE OF THE KOVALENKO REGIONAL ART MUSEUM IN KRASNODAR, AND THE STATE ARCHIVE OF THE KRASNODAR REGION (KRASNODAR). THESE LETTERS REVEAL NEW DETAILS OF THE ARTIST'S BIOGRAPHY AND SHED LIGHT ON MANY ASPECTS OF HIS CREATIVE METHODS. IVAN POKHITONOV STAYED AS A GUEST AT LEO TOLSTOY'S YASNAYA POLYANA ESTATE FROM 14 JUNE TO 5 JULY 1905. IN LETTERS TO HIS COMMON-LAW WIFE, YEVGENIA WULFFERT, HE WROTE ABOUT HIS IMPRESSIONS OF THE VISIT, HIS MEETINGS WITH TOLSTOY AND TOLSTOY'S WIFE SOPHIA ANDREIEVNA, AND HIS WORK DURING THE STAY. In October 2011 the Tretyakov Gallery hosted a remarkable event. In the room featuring Vasily Polenov’s works the museum put on view his two compositions – “He That Is Without Sin Among You” (1908) and “Guilty to Death” (1906), from his series of paintings “Scenes from Christ’s Life” (1890s-1900s). Found by chance at a North American educational institution, the pieces were displayed by Bonhams auction house at a pre-sale exhibition. The solo show of Ivan Pavlovich Pokhitonov, titled “Artist the Sorcerer”, dedicated to the artist´s 160th anniversary, is being held at the Tretyakov Gallery in the “Year of France in Russia”, and its mirror event, “Russia in France”. Although unplanned, this overlap is extremely natural. It would be hard to find another artist of the second half of the 19th-the early 20th centuries whose oeuvre reflects Russo-French connections as naturally as Pokhitonov. In June 1898 an important event occurred at the Tretyakov Gallery, already then donated by Pavel Tretyakov to the city of Moscow. Pavel Mikhailovich acquired for the gallery the paintings by Viktor Vasnetsov, "Warrior Knights" (1898) and "Tsar Ivan the Terrible" (1897). At the same time Tretyakov had the pictures on display re-arranged: the exhibition rooms were closed until early November and Vasnetsov received the opportunity to make new amendments to his recent pieces. "In the ‘Warrior Knights’ everything that needed touching up was touched up," the artist wrote to Tretyakov on October 5 1898, "for the better, I believe." Amazingly, this was said after the artist had been working on the painting for 30 years.